One of the most common marine snails, the Periwinkle (Littorina littorea) is widely distributed along the tide pools and rocky shorelines of North America. Having a rounded shell of any of a wide variety of colors, they grow to no more than 1-1/2 inches. The periwinkle is the most slow-moving of the marine snails. In the wild it will climb up out of the water and attach itself with mucus to rocky surfaces, where it keeps moist as the tide splashes onto it. Using a round mouth structure called a radula, it feeds by scraping algae off the rock. 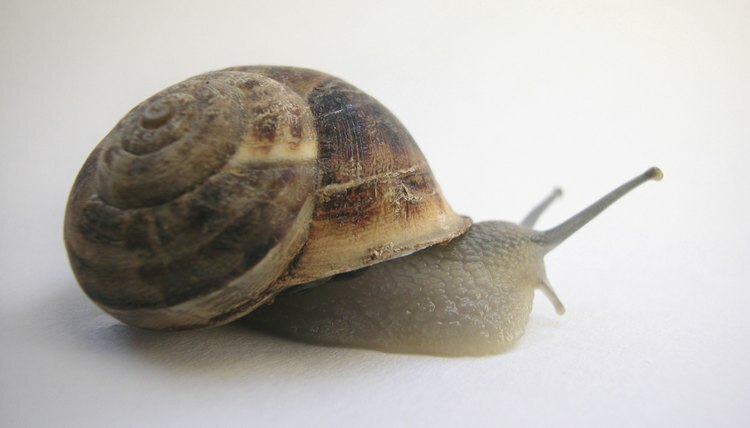 Keeping periwinkles in an in-home aquarium takes time and dedication because the snails will continue this behavior in captivity and must continuously be returned to the water or they will dehydrate. Having a fairly thick operculum, (the little "door" at the opening of the shell), periwinkles are well protected from attack by other aquarium occupants. Introduce the snail into an established salt water aquarium that already has a growth of algae, since this is the periwinkle's main food. 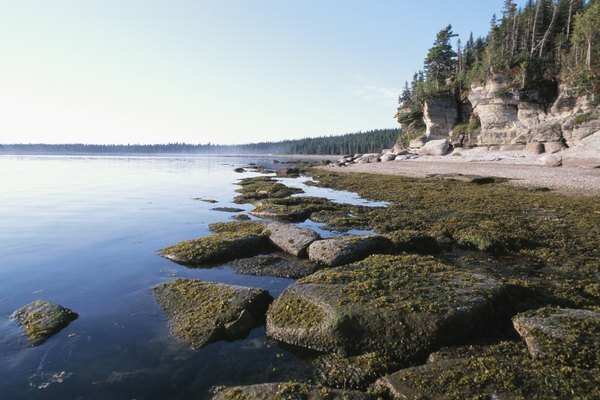 If algae is insufficient, dried seaweed may be offered as a substitute until algae growth has increased. These snails use little energy and may only eat every two to three weeks. Move at least four snails to a separate tank. It is nearly impossible to differentiate gender visually so transport enough snails to ensure including both males and females. These snails breed only once a year and should be separated from the main aquarium when the females lay their eggs, since the planktonic larvae are very prone to predation by other aquarium residents. Allow enough height above the water line to allow the snails room for courtship and mating, as this is done out of the water. Females will lay eggs in mucus bundles which will dissolve and hatch into shell-less larvae. Observe these snails daily, as their normal behavior is to climb up out of the water and wait for waves to splash them. If not returned to the water they will die of dehydration. Return snails that have climbed above the water line to the bottom of the aquarium, being careful to ensure they remain right side up. These snails are unable to right themselves and will be unable to feed if not righted. If the aquarium does not have a build-up of algae for the snail to feed on its diet should be supplemented with dried seaweed. Holding a periwinkle snail in a hand and humming to it will encourage the snail to come out of its shell and crawl about. This species of snail is not recommended for aquariums because of their tendency to attach themselves to surfaces above the water line, leading to dehydration. These snails cannot right themselves if they become upended. If not righted, they are unable to eat and will starve. Dru Simon has been writing in various venues since 1977, including monthly articles in "Computer News," proprietary instructional manuals for "OnQ Insider" and the fictional trilogy, "The Siliphore." She attended Long Island University where she studied psychology and philosophy. Simon's more than 20 years in the hospitality industry has given her "insider" insights she happily shares with travelers everywhere.